He had simply written down music already finished in his head. Page after page of it — as if he were just taking dictation. When it comes to writing, do any of us know what that feels like? Maybe once in a blue moon we are lucky enough to stumble into a Mozart-esque state of content creation — dropping perfectly formed prose into our blog or ebook without any struggle. For most of us content marketers, this is not the case, even though we aren’t short of inspiration, ideas, or coherent thoughts. Why? Because we’re writing backwards. The way most of us approach writing goes against how our brains are wired to think. If you’ve ever stared at a blank page with that unforgiving cursor blinking-blinking-blinking in expectation, you might have already suspected this. I had a complete “aha!” moment about this obstacle when I read Dan Roam’s excellent book, Blah Blah Blah: What To Do When Words Don’t Work. … throughout the eons of human development, our ability to think has evolved along two different paths. One path specialized in seeing the world as lots of little pieces, while the other path specialized in looking at the world as a whole. We struggle with writing because it requires us to put the pieces into a sequence, while thoughts and experiences are experienced all-at-once. When we sit down at the blank page, we’re asking our brains to squeeze the totality of all our thoughts and experiences around a topic into a sequence. To make this process smoother and more efficient, we need a translation method from our visual (all-at-once) mind to our verbal (piece-by-piece) mind. Collect and create idea chunks. Lay them out to find your model. First, we want to collect all the pieces — the potential ingredients — before worrying about their proper order. We’re looking for what I call “idea chunks,” coherent thoughts in their simplest form — just a phrase or a few words that capture an idea. Practice breaking down your ideas into small elements. Bonus points for adding a simple drawing! Try a shape or quick diagram that will trigger your memory of the idea. The magic tools here are index cards or sticky notes — tangible objects you can arrange (and rearrange) in physical space. Index cards are especially flexible because you can stack and shuffle them. They’re also easy to transport with you wherever you go. Spend a few minutes just jotting down thoughts as they come, one idea per note or card. Even better, carry a stack of index cards with you everywhere you go to catch ideas as they occur. If you’re like me and always have a notebook handy, you can use a little mark or notation to indicate that you’ve transferred an idea to an index card once you’ve done so. Now you have your idea chunks. The next step is to find your model. The model is where the meaning is. It’s an organized structure that shows the relationship of each of these idea chunks to each other. You’re going to find your model by laying everything out and grouping ideas together. As you spread out all of your idea chunks and see them all next to each other, your all-at-once brain starts to see relationships and patterns. You will form a logical sequence in which to present ideas. I like to place my index cards down one at a time. If I need to, I can add a label to each column — these might represent subheads or chapter titles, depending on the project. After reviewing all of my idea chunks, it becomes clear to me what’s missing. I can then reorder the cards in each column, create transition columns, and go on adding and subtracting until the model feels complete. After doing this a few times, you might find that certain types of content have similar structures. A landing page, for example, may always have sections like benefits, features, testimonials, and so on. For pieces of writing you create often, consider creating a set of top-row cards that serve as a template. 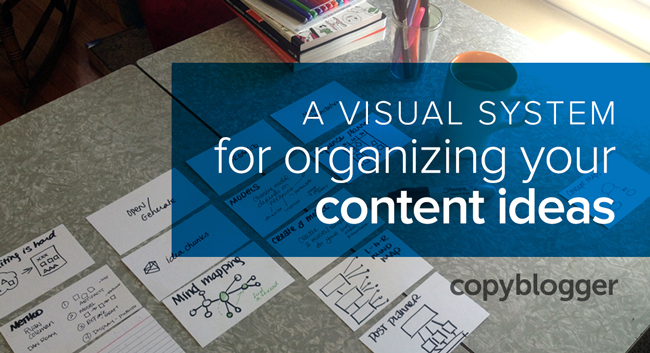 Essentially, you now have a visual outline of what you’re writing. Sitting down to the page should feel a lot easier now. And there’s no rule that says you have to start writing at the beginning! Your ninth grade English teacher’s advice is still true today: save the very beginning and the end for last. You can begin with the actual sentence-smithing anywhere you like, because it’s clear where each chunk needs to end up to make your writing cohesive. Make a note of where the idea appeared (ebook, blog, etc.) on the back of each card and keep them handy. These ideas are your building blocks, and they will likely have a place in another project — an idea from a blog post might work perfectly in a presentation, product, or course. One story might serve you across multiple topics, and if you have a stack of stories, you can reference them when you need to illustrate a point. You’ll save time because you may already have the perfect example in your writing arsenal! You can also take it a step further and create a set of prompts for parts of the writing process you tend to struggle with. For instance, if you always get stuck on the headline of your blog post, make an entire deck of headline prompts that you can review when working on a blog post. I hope you’ll find that this simple, visual process will turn your all-at-once, visual brain into the ally of your piece-by-piece, verbal mind. The result? A more creative and efficient writing journey. How will this method help you with your current (or next) writing project? Kelly Kingman is obsessed with using visual tools to help people get ideas out of their heads and into the world, a preoccupation informed equally by her dual background in writing and design. Kelly is a sought-after graphic recorder. She also teaches "whiteboarding skills" workshops to help people use the power of simple drawings to communicate more powerfully.